Like a photograph that accidentally captures something historical, the members of the Kartemquin Films collaborative who made The Chicago Maternity Center Story initially sought to bring to light the plight of women who would be affected by the 1974 closing of the maternity center. An affiliate of Northwestern University, the center offered a low cost, midwife-attended home-birth. But a deeper reality was that the center gave the women and their children a chance to live. In the 1970s, minority women seemed to understand that having a baby in a Chicago hospital meant they were four times more likely to “die” in childbirth, and that their babies were two times as likely to die as their white counterparts. The film’s gentle voice-over delivers that bone-chilling reality with a calm detachment. The camera, unknown as a potential adversary at the time, communicates without mistake the hospital board members’ disregard for the fragile existence of the women. None of the board members had the slightest concern for the women, who, without a $50 midwife option, had only a $600 local or $1200 private hospital delivery available to them. Advocating for themselves in front of the board, the women never mention the statistics. But as the film evolves it catches the moment—the exact heartbeat—when health became business first, and patient-care second. The Chicago Maternity Center supporters starkly contrast the board members who are primarily men, old and white. In a lingering video snapshot, the administrators’ callousness leaps off the screen. Smirks and eye-rolling eventually come back to haunt board members lacking the media savvy to restrain their contempt. With every dismissive gesture captured, the disdain for the women is recorded. There, for posterity to view, administrators would learn their lesson—although too late for the center. The Chicago Maternity Center Story is a black and white snapshot that today shows us that our healthcare system hasn’t come that far. That system is still driven by profit, and not our best interests. This film illustrates the media-suppressed reality that giving birth at home is actually desirable. The environment has fewer germs and lacks many of the compromising variables and motives that exist in a hospital. 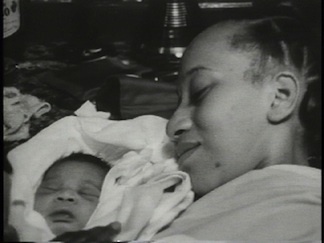 The film includes footage of a young black woman giving birth at home with a midwife from the center in attendance. It shows a difficult birth (not for the faint hearted) that is actually rendered almost commonplace by the skill of the veteran midwife. The breech is merely a fact to be dealt with not a cause for panic. The young woman is lucid and calm once the birth of her healthy baby boy is over. Following the screening, STF moderated a Q&A with Kartemquin filmmakers Gordon Quinn and Suzanne Davenport, and film subject Laura Newman. Question: What was your motive in making the film? Suzanne Davenport: I was at Columbia and Jenny Rohrer and I were going to made a film for coursework. Originally we hoped to make it to save the center. But by the time we were done – it took us one year to shoot and four to edit – it was closed. When I had my own baby unexpectedly at home, the words from the film’s midwife saying, “Just let the body do its work,” came to mind and I was suddenly at peace. Q: What are your feelings watching the movie now? Laura Newman: I lived in Chicago at the time and now I live in New York. Sometimes I feel like I’m going back to 1954 in this country with women’s reproductive rights. The maternity center had such a rich history. Then you saw the beginning of big medicine which meant the demise of the Women’s Maternity Center.